We already know the proposed background-check bill was a gun-registration plan. But the huge background checks we already have just turn the criminals free. Do we need more of that? Monitor the Innocent or Capture the Criminals? When people tell me: "But I'm only one person," I shoot right back: "Everyone is only one person." 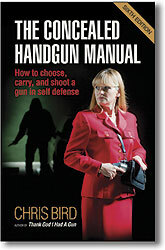 If what you need are some ideas, try Tactics That Work: https://www.gunlaws.com/Tactics%20That%20Work.htm. If you want to set brush fires, try cognitive dissonance: The Politically Corrected Glossary, https://www.gunlaws.com/politicallycorrect.htm. "It does not require a majority to prevail, but rather an irate, tireless minority keen to set brush fires in people's minds." --Samuel Adams. Although we are constantly assured that a gun registry would never be made public, the same assurance was made for CCW carry-permit files. Looks what's happened there -- entire communities have had themselves and their property exposed. Is this something we want to encourage? Should people who have done such violence to privacy be brought up on charges? Complete details on the so-called "universal background check" fraud are explored in this issue of Page Nine. There's a reason that bill was defeated, despite "news" claims of overwhelming support. Nancy Pelosi wrote to me and said it is 92% in favor (the media was wrong with their claim of 90%, go figure). Nothing serious in government has 92% support, not even giving away money. Why don't they arrest all the Brady criminals the find? Reader Doug L. asks, and I frankly haven't got a good answer: "Logically, if voter ID laws are discriminatory because they require a photo ID, then aren't gun background checks discriminatory because they require a photo ID?" Great question. Do we have to give up one, or both? Maybe the whole discrimination thing has gotten out of hand. could we justify a government-run list of gold and gold owners? The family of a charming young teenage boy had pictures of their adorable young child circulated by the "news" media after he was brutally shot to death by a ruthless wannabe vigilante. Then it came out that the teenager was actually a 6-foot-two-inch football player with a history of violence and gang connections who had pounded the block-watch captain's head into the pavement until he was bleeding and nearly unconscious. The survivor, on trial for his life, caught a tough break from a circuit-court judge in pre-trial motions the other day. It turns out that prosecutors seeking to convict George Zimmerman for (the merciless cold-hearted vigilante murder of poor little Trayvon) (defending himself against the brutal life-threatening assault by Trayvon Martin) (you pick), will be able to suppress all evidence showing the attacker's controversial school records, previous drug use, history of prior fights, ownership of removable gold-tooth caps, or any text messages and photos found on Martin's cell phone, which defense attorney Mark O'Mara has seen. A delay in the proceedings was also denied. Trial is set for June 10. If you think the nation's diligent media turned the Jody Arias thing into a circus, you ain't seen nothin'. Anyone armed who is concerned about a fair trial should keep this in mind, and read After You Shoot: Your gun's hot, the perp's not, now what? It's always better to avoid a gunfight than to win one. 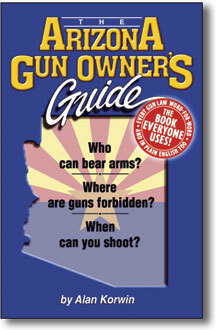 https://www.gunlaws.com/AYS.htm. Zimmerman, who is living in hiding, and will likely have to continue doing so if he wins the case, has gained more than 100 pounds since the incident in February 2012. For good measure, the judge decided witnesses will be banned from saying if they think the trial is politically motivated. You may recall the initial police investigation found this to be a clear case of self defense, with no grounds for a trial. Then Jesse Jackson and Al Sharpton got on TV, and a Florida prosecutor who usually has nothing to do with such activity took up the case amidst a non-stop firestorm of political commentary that blacked out all other news coverage for days. Worse than the Arias thing. The United States had South Korea make an announcement to the AP, for reasons that were unclear, about North Korea's routine test firing of missiles. The U.S. typically makes such announcements, and frames the context. In this case, the launches were described relative to "tentative diplomacy" aimed at easing tensions. It is the U.S. that monitors all North Korean missile launches from our ground-based visual, radar, radio, infrared and microwave monitoring stations, as well as seismic, piloted, drone, naval and satellite observations posts, and from spies all around North Korea. Most of South Korea's monitoring capabilities are directly tied to U.S. support. "There is always a reason why the U.S. allows its allies to make reports instead of doing it directly, but it's unclear why they let the South Koreans do it this time," a knowledgeable observer pointed out. The lapdog AP reported the report that was reported, without reporting, in typical "news reporting" fashion. In other news, U.S. agents chose to inform the AP directly that North Korea withdrew two mid-range "Musudan" missiles recently, and pointed out that the North is banned from ballistic missile launches under U.N. Security Council resolutions, as if that's meaningful. Why they didn't have the South make this announcement was also unclear, but the AP dutifully carried the handout they were handed. No one involved pointed out that these U.N. resolutions are meaningless wastes of paper, ignored by everyone and serve no purpose other than to fill newspaper space, thereby contributing to deforestation and global whining. By PHILIP ELLIOTT -- WASHINGTON (AP)- - The Associated Press' president and chief executive says the government's secret seizure of two months of reporters' phone records has already had a chilling effect on newsgathering, a week after the subpoenas were revealed publicly. In his first television interviews since the AP reported the Justice Department seizure, Gary Pruitt on Sunday said it has made sources less willing to talk to AP journalists and, in the long term, could limit Americans' information from all news outlets (emphasis added). He called it "unconstitutional" and a violation of the First Amendment. Still clueless even after government agents "violated" them, the AP leader (and his minions judging by their ongoing behavior), believes government interference might restrict news the American public gets, and that the "news" machine's cozy relationship with government isn't already among the main limitations on information the public receives. "Chilling" effects on reporters is such a remote factor it is hardly worth mentioning. "The public is actually lucky that government agents illegally collected a ton of information from the AP," said The Uninvited Ombudsman, "as this woke up that slumbering giant to the normal levels of abuse the public routinely faces." Awakened and outraged, the AP may actually do something, where it otherwise snores so loudly you can't hear its mind-numbing banter. Government overreach and rights violations in Second Amendment issues are legendary and well known, despite news blackouts. Reporters, especially AP reporters, are already one of the greatest restrictions on news the American public gets. See, for example, any of these 123 reports: https://www.gunlaws.com/PageNineIndex.htm. 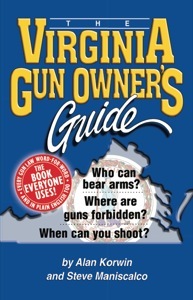 For grotesque ethical violations in the "news" that are fun but infuriating, look here: https://www.gunlaws.com/NewsAccuracy.htm. Anything outside the approved mainstream narrative is suppressed or distorted beyond recognition, a fact known by anyone who carefully follows a subject of interest to them. The AP is famous for taking government handouts and spoon-feeding them to the public with no reporting whatsoever. Using a popular media technique, we could take Pruitt's words above out of context, and use them to summarize the standard model of AP reporting for many stories: "The people of the United States will only know what the government wants them to know." That's an exact quote. An accent might provide some clever color, just for fun: "Ze people of ze United States vill only know vat ze government vants zem to know." Maybe not so funny. In lockstep compliance with Dr. Brown's rules for vilifying guns in the "news," AP reporters Bassem Mroue and Albert Aji on Sunday turned a story about a vicious muslim terror-tactic abduction into yet another gun-bashing story, by using the slanderous word "gunmen," as Brown recommends, instead of anything more accurate or descriptive. Brown, whose revealing guidelines help make any story into a gun story, and any gun story a fear-filled screed, have been recently updated to include new buzzwords, anti-rights programs, mind-numbing legislative proposals and propaganda being promoted by liberals, now called progressives, leftists or blue staters. One look at his guidelines is instantly enlightening. Much of what passes for news is described and recognizable as propaganda techniques that can be applied by any writer, as in the case cited above. Why call a kidnapper a kidnapper and lose an opportunity to smear firearms, when you can simply refer to any criminal as a gunman, and get the job done. Lack of prosecutions outrages Congress. Lack of arrests outrages everyone (except the media, who are clueless). Congress is 20 years behind the curve on this one. Push for more of the same in Manchin-Toomey bill now questioned. Do we want innocents surveyed or criminals apprehended? Nothing. They missed this part of the story altogether. Actually, that's not correct. They had it and suppressed it. Rep. Trey Gowdy (Rep., SC) asked AG Eric Holder why so few failed background checks lead to prosecutions. Holder didn't answer. Trey actually helped him off the hook, sympathizing about the low "jury appeal" of NICS-denial cases. 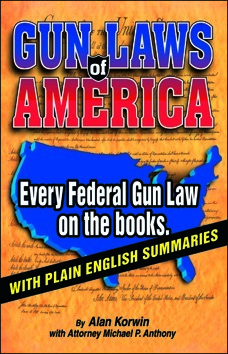 But after all, attempting to buy a firearm if you're an escapee, felon, fugitive, jihadi, certified mental case, illegal alien, renunciant, drug lord, etc., is a five-year federal felony, on top of filling out the form falsely, on top of handling the gun before trying to buy it. That's what the NICS background check finds and prevents, or so we're led to believe. What happens to all those attempted criminals? Then the AG ducked and dodged about seeking to grant illegals citizenship (which would remove them from the prohibited possessor list, by the way). All media follow these things but it somehow didn't make the "news" (watch five juicy minutes: http://www.youtube.com/watch?v=RaxZeA9VscI). In other words, we prevented one million gun sales from going through, presumably because these people are murderers, rapists, fugitives, muslim warriors and similar. We have the FBI on the phone, the bad guys standing there waiting in front of an armed guy (the gun dealer), and the bad guy's name and address on a form, from a picture ID. Why don't we arrest these people? We turn them loose. The FBI looked them up, determined they're on Wanted Posters (figuratively speaking), or just got out of prison, or committed some major (or not so major) crime years ago, or are on a watch list, or whatever. The FBI utters the single word "Deny" to the dealer, and that's it. Then you tell the criminal in front of you, "Have a nice day, please close the door as you leave." That's what the new and improved "universal background check" that failed in the Senate is designed to do too, but to more people. The phrase "lacks sufficient prosecutorial merit" only enters the discussion in this Page Nine report. People who hate guns or have no respect for gun rights want to expand the system so more innocent people are included in the FBI list of 10.3 million people-to-be-kept gunless. More (theoretical, I'll get to that in a moment) criminals will be found and turned loose too. Gun owners and people who can see what's going on want to do something about the tens of thousands of criminals we're supposedly finding and turning loose with the system we have. So which should it be? Deal with these countless (supposed) criminals we're finding now, or throw more wood on the fire? Add more burden to the innocent or burden the criminals already? We barely have funds to do either. We apparently have will to do neither. Bizarre. But wait -- are these really criminals we're finding? If the FBI numbers are correct -- and why wouldn't they be -- 1.01 million Americans have had their right to keep and bear arms denied by a computer readout and a bureaucrat on the phone (a call-center clerk, actually). That's the FBI's NICS process. Where is the due process in that? Don't you have to be tried, face a jury, have a judge, a lawyer, compulsory process for calling witnesses, rules of evidence, something more than a clerk and a phone call, to have your fundamental constitutional rights stripped away from you? Oh, I'm sorry, you have the right to appeal the computer's denial of your rights, so that makes the system fair? Many people appeal the denials and win, so this is good? No, this means the system is falsely denying people their rights, and no one is being punished for the false denials. This means you are found guilty, and are allowed to prove your innocence. Guilty until proven innocent is reprehensible in the American system of justice. Who concocted this abomination? Denial of civil rights under color of law is a criminal offense. 18 USC §241 et seq. The system is run by... wait for it... the Dept. of Justice. Maybe they don't prosecute more of these because they know they can't get convictions? * Maybe we aren't denying guns to hardened criminals after all? You can't have it both ways. If NICS is keeping us safe, and mass murderers, or regular murderers, or just escapees and lo-class thugs are being prevented from buying guns at retail and paying sales tax, then we should definitely begin arresting them while they stand around at known locations. If on the other hand, the system isn't all it's cracked up to be, and far too many of these people are regular citizens being denied their rights by a computer, then the idea of expanding the program needs a second look. How much computerized rights denial should we introduce into the fabric of society? We should prove the worth of NICS by arresting the tens of thousands of criminals it claims to find, try them in court, make us all safer, and see if that's truly the case. Where is the "news" media on all this? Once again, their coverage is abysmal. The public is not misinformed, they are uninformed, incapable of making anything approaching a rational decision. Congress, as you'll see, is in the same boat. *Back when this began in 1994, I was told by numerous authorities that a NICS denial is insufficient grounds for prosecution (or even a response or arrest!) for all sorts of reasons. That White Paper will stun you: https://www.gunlaws.com/BradyArrestsLacking.htm. Sorry, Mr. Gowdy, you're 19 years behind the curve, and the "news" media has left you there. It's not your fault. In all fairness, they're there themselves. Two of my favorite excuses from back then, this one from the Clinton White House, Janet Reno Justice Dept, and ATF (all offered the same response to my direct question): "The Brady law is neither designed nor intended to increase the annual number of federal prosecutions." ...and this one merely philosophical from a knowledgeable observer: "Because unless we have more crime and violence we won’t be able to justify taking everybody’s gun away." Summer's a good time for a good read. Although 90% of Americans suddenly support something called "universal background checks," which they had never heard of before, now that a madman killed little children in Connecticut, Congress has done nothing. The checks would have done nothing to save the children, a point on which everyone agrees. Dianne Feinstein's bill to ban guns Americans already own, which she has been promoting for 20 years, did not even make it to Congress, again. Bills to identify crazy people have not been introduced. Or drafted. 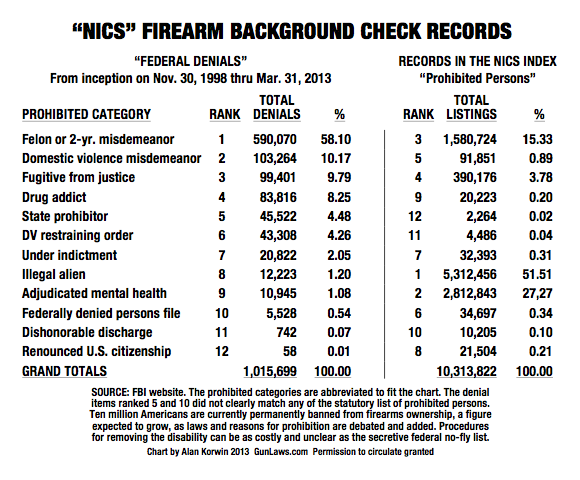 -- In the two years studied (CY 2002-2003), NICS handled 16.7 million background checks. 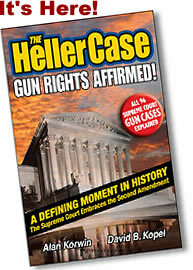 -- 121,909 people were denied firearms, and the FBI referred these to ATF, who refers them to their Brady Operations Branch, who refers them to their NICS coordinators, who refers them to their ATF division offices, who refers them to their satellite offices or field offices, to see if they meet "USAO prosecutorial guidelines" so they can be brought up on charges of criminals trying to buy guns. In other words, just because a person was denied a firearm does not mean the U.S. prosecutors want to go after them. They have to meet guidelines. Most don't. Without boring you, most people in the NICS chain-of-command don't have the guidelines, haven't been trained, don't even know there are guidelines (I didn't, like you, I thought most everyone caught is a criminal). The functionaries don't have a way to communicate up or down the chain, have cases "without prosecutorial merit" (which is not described) because they just send piles of "captures" over without review. The space they have to make notes on their computer screens is too small for notes. Typical Keystone Kops procedures plague the system -- "increasing the workload of already overburdened field investigators... delaying investigation of prosecutable cases... cases without merit... insufficient resources... insufficient staffing... extensive case backlogs... " it's a loooonng list. -- 7,030 prohibited possessors got firearms because their "delayed" response time periods ran out. ATF agents either did not conduct retrievals, did not do them in a timely fashion, took four months to more than a year, and did not document retrievals so there was no way to tell what happened, if anything. -- Before trying to retrieve a gun from someone who should not have it, ATF sends a letter telling the person to give it up. Sometimes. They might include a deadline. They might act if there is no response. Or not. They let the person give the gun to anyone, which can include another person who cannot have a gun. Yes, you read that right. In 55% of these cases (from this study) ATF made no records of what happened, and lets the case drop. Only ATF's high-profile homicides, arson of occupied satructures and gun-smuggling makes the news. "ATF special agents did not consider most of the prohibited possessors who had obtained guns to be dangerous and therefore did not consider it a priority to retrieve the firearm promptly." ATF did not track the retrieval process at all. -- ATF had not conducted a NICS coordinator training conference in years. When it did, 6 of the 17 coordinators showed up. -- In a sample of 200 denials referred for action, 22 were illegal aliens. These are referred to Dept. of Homeland Security (ICE) and the Brady Operations Center. The ATF division offices "closed these cases without investigation because they did not involve other prohibiting factors." Illegal alien status is one of the nine enumerated bans specified in statute. ATF has decided not to enforce this law, out of hand. 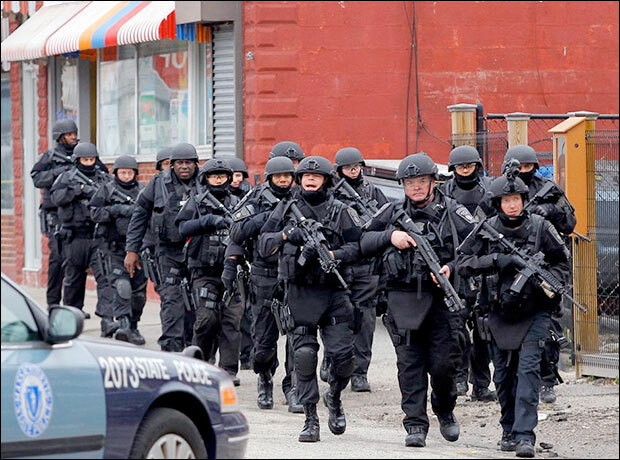 -- In 36% to 95% of the cases, NICS division field offices provide no feedback to the Brady Ops Branch. Command has little idea what the local offices are up to. "Several of the field office group supervisors told us they did not investigate the majority of the referrals they received." -- Between 8% and 35% of denials in the samples were people found not to be prohibited from possessing firearms. "In the end, 62 cases were referred for prosecution, but most were declined by prosecutors or dismissed by the court. Out of the original 73,000 denials, there emerge just 13 guilty pleas." Is this what 90% of the public supports? The Post only ran this online. What are we paying for the 13 guilty pleas? Is this a good use of limited resources, or does it just make some people feel good, and make anti-rights legislators look good as long as the "news" keeps you in the dark and you don't know what's really going on? "Historically, USAOs have been unsuccessful in achieving convictions in many of these cases and consequently have been unwilling to expend their limited resources on prosecuting most NICS cases." "These cases lack 'jury appeal' for various reasons. 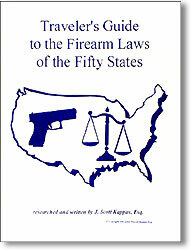 The factors prohibiting someone from possessing a firearm may have been nonviolent or committed many years ago. The basis for the prohibition may have been noncriminal (e.g., a dishonorable discharge from the U.S. military). It is also difficult to prove that the prohibited person was aware of the prohibition and intentionally lied to the FFL [federally licensed dealer]. We were also told that in parts of the United States where hunting historically has been part of the regional culture, juries are reluctant to convict a person who attempted to purchase a hunting rifle." Nearly one in five injury-related deaths in children and adolescents involve firearms, reports Liz Szabo, a reporter whose anti-gun stories are regular features in USA Today, a "news" paper with one of the worst anti-gun bias records in America. Thanks to First Amendment protection, they can spin stories and spew propaganda or anti-rights bigotry without any media control. More than four out of five injury-related deaths in children and adolescents do not involve firearms, but framing a story this way is banned by USA Today bias requirements. It is more important to imply fear of guns to readers, than to warn parents that 80% of the lethal risks their children face are from, well, the story doesn't say. Szabo is a winner of the excellence-in-media award. 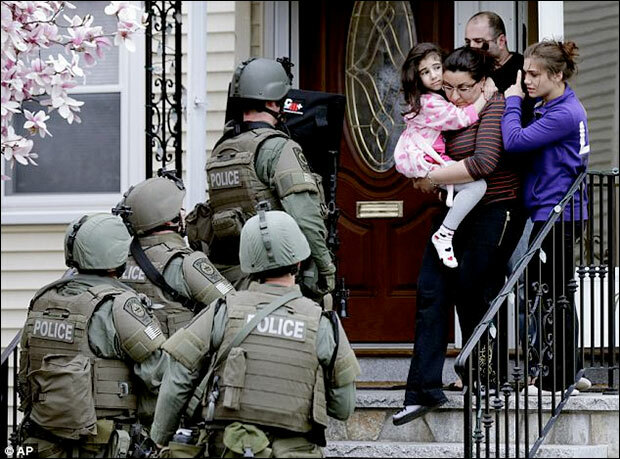 "Why attack guns, when you could help more than 80% of parents keep their kids safe?" asks the Uninvited Ombudsman. "Do they have an agenda, rather than reporting the news and keeping the Republic informed? Can we bring these reporters up on some sort of ethics charges? Do they even know what harm they do, attacking fundamental rights while hiding lethal truths from the public?" Unfortunately the answer is no, they know not what they do. They actually think they are doing good. It's unclear if "youths involved in accidents" includes "gangbangers in ghettos shooting each other," a frequent wording problem in lamestream reports. A USA Today story that encouraged gun ownership, and spoke highly of the many people who are alive today because they were armed and shot hardened criminals, well that story never ran in that paper, though it could run as often as the scare tactics do. This is called ethics. Makes me ashamed of those colleagues. Part II: The final negotiating conference on the U.N. Arms Trade Treaty has failed to produce a Treaty Text that achieved consensus approval, to report to the U.N. General Assembly. It sounds like the wonderful effort by the glorious U.N. for an international ban on horrible guns has ended in failure. Here's what really happened. In an effort to get unanimous support, called "consensus approval," the U.N. negotiating conference voted on an Arms Trade Treaty (ATT) draft and got three "no" votes -- from the worst human-rights violators known to man -- Iran, Syria, and North Korea. They wanted to be free of the U.N.'s proposed controls, which is a good thing in a bizarre sort of way, but it won't stop the U.N.
That vote just kicked the whole thing up to a vote of the General Assembly members, for a less prestigious, but easier-to-get approval of the "Resolution" which has the same language. On April 3, 2013 they got 154 yeas, 3 nays (the same ones) and 23 abstentions. The U.S. voted "yes" (but that doesn't mean we adopted it). Russia and communist China were among the abstentions. This puts the draft in play, and instructs the Secretary General to open it up for signatures. When 50 nations sign it -- and get it ratified by their governments -- and deposit that ratification with the U.N., the treaty enters into effect, 90 days later. That vote opens on June 3, a few days away. It is expected to pass. Our president is expected to sign it, which is an action taken solely by the Executive Branch, and is only for show. Sorta. The media and the antis will treat like an act of Greatness. For it to become law here though, it would need ratification by 2/3 of the Senate (normally 67 out of 100 votes), and that is highly improbable. Now. But it will hang over our heads literally forever. Procedural trickery could possibly achieve "two-thirds ratification" with fewer than 67 votes, but that's another story. 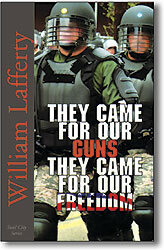 You will see a flood of stories from the "news" soon assuring you the ATT has little affect on the Second Amendment. That's simply false. I'm also predicting a new narrative that bombards us with a sense that we are "out of compliance with the international community," and that our gun laws are "anachronistic," (old fashioned), no longer appropriate, that the world is sneering at us, that we should get with the program, and even that this should be the law even without it being the law, and we should obey. The "news" media is becoming one of the greatest impediments to freedom by campaigning for an agenda instead of reporting what is. "Small arms" are right there in the treaty language. Signatories are required to create "national control lists" of all arms and ammunition imports and exports, and since this includes parts and even metals used, it's a very broad brush. 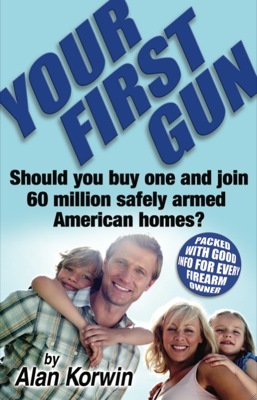 Fine imported guns could be severely affected (can you say Glock?) Make, model and end users are covered, the U.N. is supposed to get copies of the lists, and the U.N. is supposed to give copies to every other participating nation, who are encouraged to make the lists public. "Improvements" are supposed to be made by amendment after six years. Will this affect the tyrants, dictators, mass murderers, human-rights abusers, genocidal maniacs, people who want to wipe Israel off the face of the Earth and others who it is ostensibly aimed at? An extensive analysis in the Penn State Law Review by Kopel, Gallant and Eisen (Vol. 114, No. 3) concludes that the ATT "would have no more effective force than the arms embargoes that are already imposed by the U.N. Security Council... accordingly, the ATT is a distraction." The authors point out that, "Control Arms, the leading international gun prohibition lobby, forthrightly acknowledges that, every one of the 13 United Nations arms embargoes imposed in the last decade has been systematically violated."